In a previous article I covered some of my favorite online resources for learning design. It seems like the Internet contains a never-ending growth of helpful resources and tools for designers. Well the same can be said about developers too. 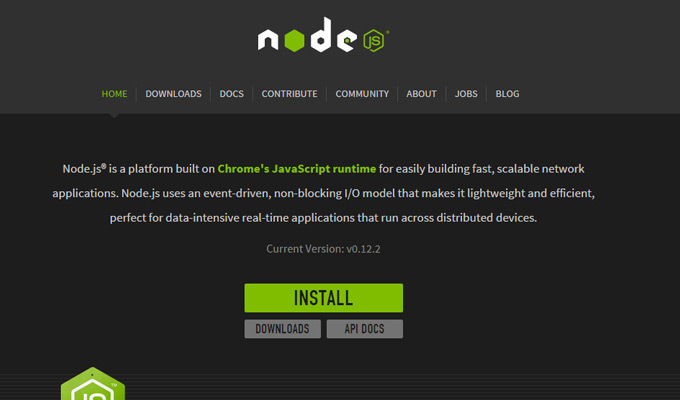 Node.js can be paired with modules and extended with frameworks just like any other language. Many devs prefer studying Node as an easy introduction to backend development. It can be more verbose than Rails but it’s also easier to compile and it can teach more about programming technicalities. If you’re brand new to web application development and just want to get your feet wet, most pros would recommend at least checking out Node.js. 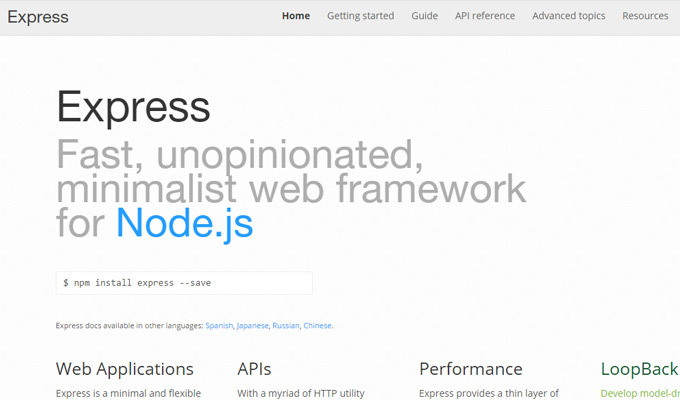 The ever popular Express.js is actually a framework built for Node.js. So if you learn how to use Node you can improve your workflow by adding a framework such as Express. Express.js is to Node.js what Bootstrap is to HTML/CSS development. Express is meant to simplify the dev process and save time. Express is not a full MVC framework because you’ll still need a separate database schema. However it does speed up the dev process for writing Node.js code with unique time-saving modules. 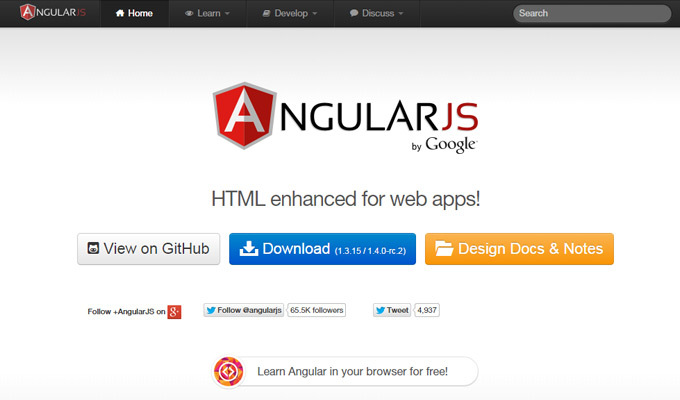 The Angular library is another free open source standalone product. It works more directly with HTML but not in the same way as jQuery. Instead of creating elements in HTML and binding them with events, you create the element as a view within Angular. This view can be manipulated without selectors and grants more control to the developer. If you’re already familiar with jQuery please take a look at this Stack Overflow post. It goes into detail about the differences and how you should think about writing AngularJS code from the right perspective. 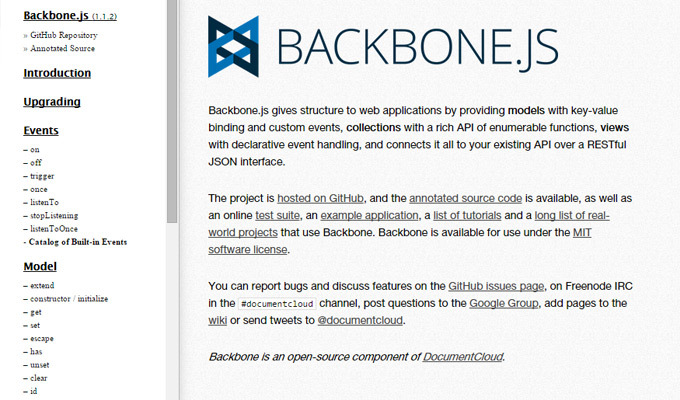 Another interesting JS framework is Backbone.js that seems perfect for any dynamic web application. Think about websites like Gmail that load information without refreshing the page. Backbone is a library meant to replicate this MVC behavior without the need to pull down new pages from the server. Since Ember is seen as much more detailed it can be difficult to pinpoint bugs and solve problems. It’s meant to be a greater solution for complicated multi-page webapps to save time writing code. Take a peek at this comparison between Ember and Backbone. Perhaps one of the newer and more detailed libraries is Knockout.js. 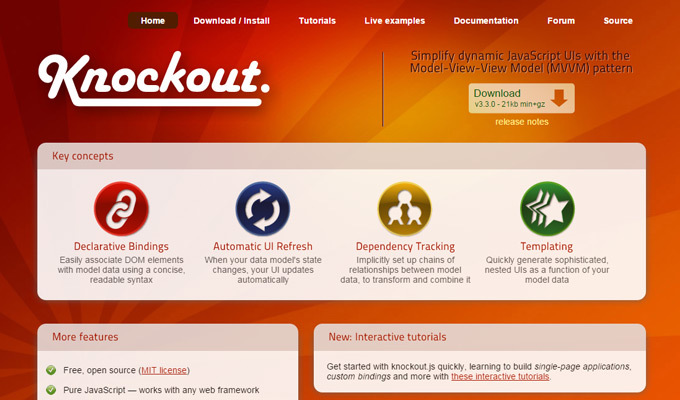 Unlike the other previous examples, Knockout.js is an MVVM library as opposed to MVC. The two systems are similar but also distinct in their methods of handling interactions. Knockout is like a separate JS library for handling user input, binding elements, and managing data views. It’s open source and not exactly one of the most popular libraries. But if you’re already familiar with MVVM then it’s definitely worth your time. If you’re looking for a flexible library to build off jQuery then consider Can.js. It’s a very unique library that can run on top of many frameworks like jQuery, Mootools, YUI, or Zepto. 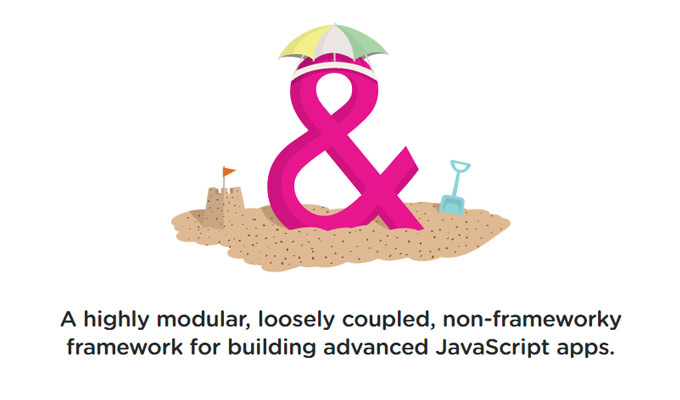 Advanced developers will enjoy learning Ampersand.js because it doesn’t treat you like a child. There are plenty of guides for newbies to get started, but the actual code writing process boils down to creative thought and careful planning. Facebook has been digging into open source code for years and recently put out a library named React.js. The primary purpose of React is to build user interfaces. This is meant to be paired with other libraries and used as an intermediary between data and events. It’s still a fairly new library and will require some acclimation before it feels comfortable. 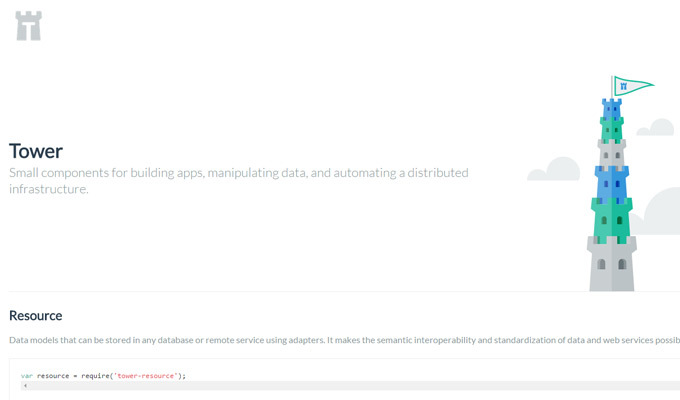 The documentation page can help you get started with setup and general methods. 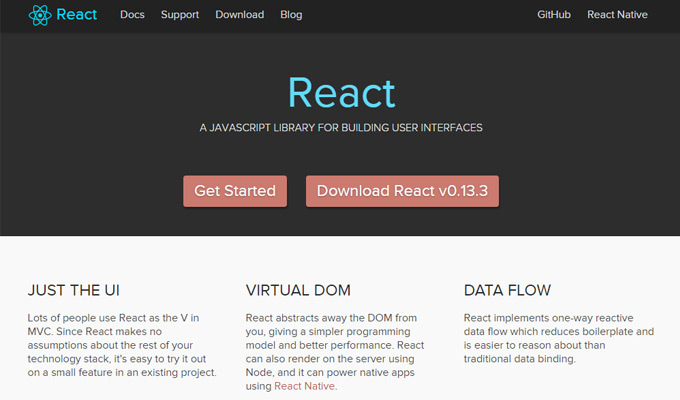 Also take a look at this Stack answer which explains the React.js workflow step-by-step. Much like the React framework, Tower.js is not a full MVC library. 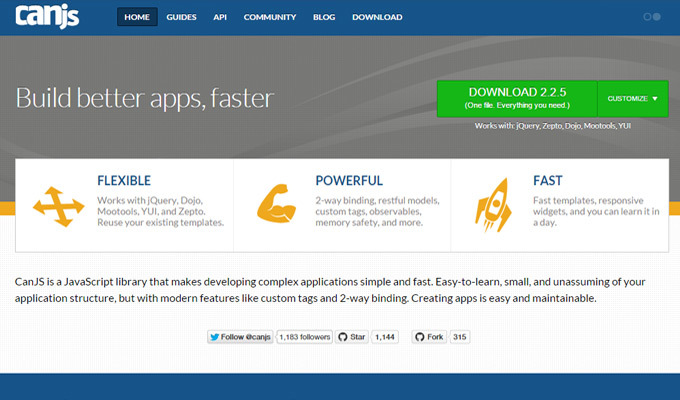 It’s meant to be used with Node.js for initializing and manipulating small components of the page. These could be anything from simple page titles to blog posts or even whole layout styles. Hacker News featured a lengthy discussion about Tower.js and how it can tie into Node.js workflows. 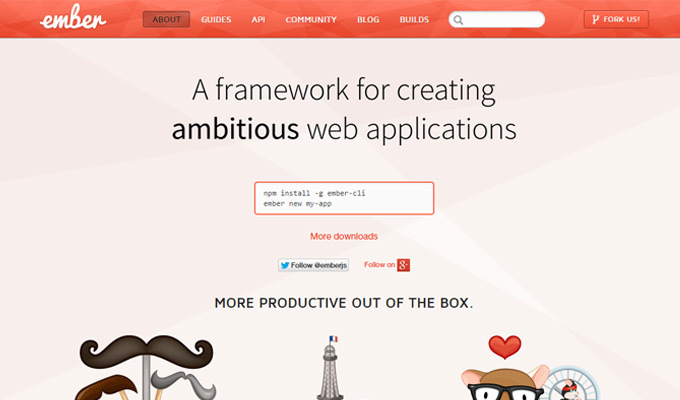 The framework is modeled after Rails which has many developers turning up their noses. But if you’re willing to give it a shot you may be surprised how versatile it can be in just the right situations. I certainly hope these JS libraries stir up feelings of curiosity in web developers. It can be daunting to learn a new library but once you get over the hump it’s always a fun experience. The trick is determining which library most accurately fits your current project. Browse through a couple of these examples and if any of them catch your attention don’t be afraid to start down the path of greater learning.